A young child looks after his even younger sibling in the Shiya Bazali Township outside of Pietermeritzburg, South Africa. Children like this are forced to take on responsibility at a very young age due to parents that are sick and dying of HIV/AIDS. It is estimated that 1 in every 4 children in South Africa are orphans due to AIDS. In 2003 the United Nations estimated that the country of South Africa led the world in AIDS deaths at 370,000. Those deaths led to the orphaning of 1.1 million children, a number that had almost doubled the 2001 figure of 660,000. 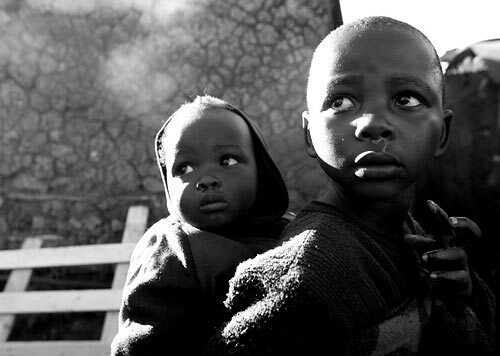 While statistics prove that the AIDS crisis in South Africa has reached pandemic proportions, there is no means to quantify the emotional anguish these orphaned children experience as they watch their parents die, coping not only with the loss of their parents but also with the fear of what the future holds for them. Without the protected atmosphere a home with parents offers, children living in orphan-headed households are much more susceptible to violence, exploitation and abuse. Studies also show that children taken in by family friends or relatives are more likely to be malnourished and underweight. As the death toll continues to rise, the future does not hold much hope for the youth of South Africa.